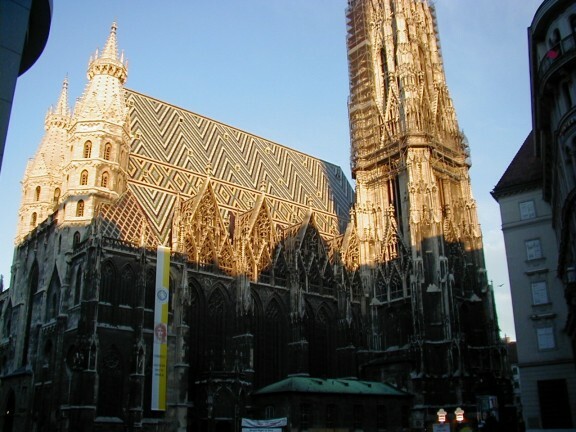 The cathedral of Saint Stephan ( German called Stephansdom) was built in romanic style, 1137-1147, or earlier. The cathedral is 107m long and 34m wide. It has four towers: The highest is the south tower at 136m, the north tower is not finished and is only 68m. On the left and on the right from the main entrance are the two "heath towers", which are about 65m. The roof is covered with 230,000 tiles. The tombstones that festoon the exterior wall of the cathedral are from Saint Stephan's Cemetery which was paved over to make Stephansplatz. The cathedral was damaged by fire on April 12, 1945, and later renovated. The largest bell is called "Pummerin" and hangs in the north tower. It is the largest in Austria and the second largest in Europe . It was recast in 1951 after being destroyed in the Second World War. Stephansdom is the heart and soul of Vienna. This is where Mozart was married, and where his funeral was held.